According to Kevin Kinkead of CBS3, the Union will announce the departure of CEO Nick Sakiewicz today. According to those close to the situation, team majority owner Jay Sugarman is scheduled to be in Philadelphia on Friday. He has reportedly called a mandatory staff meeting in the morning. The news comes on the heels of Philadelphia’s penalty shootout loss in Wednesday’s U.S. Open Cup final. The Union drew 1-1 with Sporting Kansas City but fell short, 7-6, in the shootout. It was the second straight year the Union has lost in the final of the competition at PPL Park. 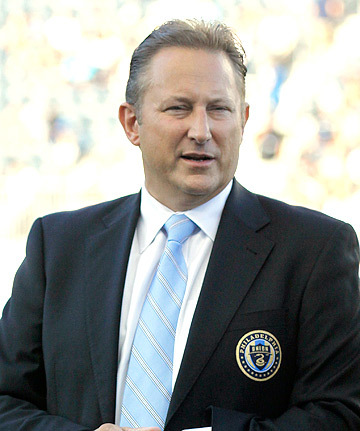 Sakiewicz owns a stake in the Philadelphia Union, so his share would reportedly need to be bought out by Sugarman. Sugarman attended Wednesday night’s U.S. Open Cup final in a private helicopter, which he landed on the Union’s practice fields at PPL Park. Sugarman is a stay behind the scenes kind of guy, so this is a major deal. One could assume Sugarman may take on a bigger role like his counterpart over with the Phillies has recently, John Middleton. After six seasons and only one playoff appearance, it’s clearly time for a change for the Union. Sakiewicz has been with the Union since 2008. UPDATE: Sugarman sent out this announcement via email. It’s official. I want to share some news with you directly. We are making a change in the front office and parting ways with Nick Sakiewicz. In the interim, Dave Rowan, current Chief Revenue Officer, will oversee day to day business operations. Nick was instrumental in helping bring a team to Philadelphia and building our organization from the ground up, and we thank him for the dedication and perseverance he showed in those efforts and his passion for the club. Now it’s time for a new era of progress to begin. Last year it was apparent our organizational structure needed to change in order to provide a stronger and more focused sporting direction for the Union. Our plan was to bring aboard a Sporting Director with significant experience to add to the MLS knowledge of Jim Curtin and Chris Albright and help us materially improve our player acquisition processes, player evaluation methods and player development capabilities. In addition, we wanted clear lines of responsibility throughout the organization, with our Youth Academy, USL team, and First Team all reporting up to a strong Sporting Director with a clear plan and a defined competitive strategy to guide recruitment, training, and teaching at all levels. Unfortunately, we have not been able to fill this role yet. We are committed to finding the right person for the Sporting Director position, and we want this person in place as soon as possible, to impact the upcoming player decisions needed to strengthen our roster and to oversee increased integration of all soccer operations. We are working to have this role filled by the end of the year. In the meantime we have continued to invest in the foundation of the Club. Over the past two years, Ownership has committed over $15 million in capital to areas that we believe are critical to building long-term success. The new training fields, new First Team Training Center, new USL team, and increased Academy commitments are all part of a plan to put in place the infrastructure necessary for success, and set the table for better performance on the field. Now we need to attract a leader and an architect on the sporting side who can build on these investments and develop a strategy that will give us an edge in the league going forward. One last, important, thing: I and the other owners want to assure you that we are committed to winning. We can also assure you that we will make mistakes – but we will acknowledge them, learn from them, and correct them until we succeed. Your loyal support as we enter this new era is critical, and we remain deeply grateful for your continued commitment as we make the Philadelphia Union a team we are all proud of.